Find all of the wonderful places to explore in beautiful Maremma Italy with this map of her cities, towns, villages and hamlets. Maremma is a vast territory, encompassing land in both the Regions of Toscana (Tuscany) and Lazio. Conventionally divided into three areas, Maremma Livornese (or Maremma Pisana as it was once known to the north), Maremma Grossetana (the central part), and Maremma Laziale (to the south). The whole of Maremma's western border is a spectacular coastline with the "Mar Ligure" and "Mar Tirreno" - the clear turquoise and emerald green waters of the Ligurian and Tyrrhenian Seas. 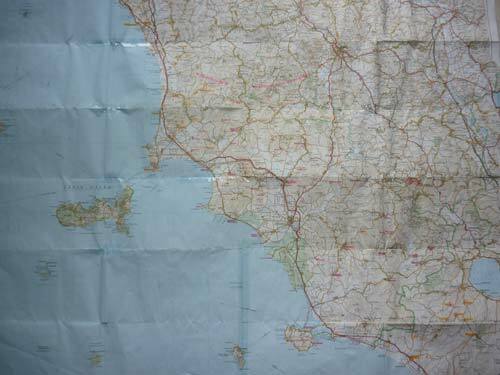 If you want a map in your bag or rucksack with you whilst you travel around la Maremma, then you will need two as the printed "Toscana" (Tuscany) maps only normally overlap south into Lazio as far as the town of Tarquinia (a paradise for Etruscan history, art and archaeology lovers). Having said that, unless you are planning on venturing further south towards Rome (Roma), just one 1:200 000 scale Tuscany map will serve you very well. My favourite (I won't part with it even though after many years of use it is falling apart!) is the one that I photographed above and can be brought - cheaply - online from Amazon. If you want to explore this unknown part of Tuscany and Lazio now - even down to a dirt farm track through woods that leads to a holiday farmhouse and then its swimming pool! - then the map I have compiled below will enable you to do just that with its satellite images. You'll be able to check-out just how far that hotel you were thinking of booking is from the beach and, on maximum zoom, even view an Etruscan tomb or two and take a walk in a Roman amphitheatre! The cities, towns, villages and hamlets in Maremma Livornese - along the Costa degli Etruschi (the Etruscan Coast) - in the Provinces of Livorno and Pisa are marked on the map with blue place marks. Those along central Maremma Grossetana - along the Golfo di Follonica (the Gulf of Follonica), the Pineta del Tombolo, Monti dell' Uccellina, and the Costa d'Argento (the Silver Coast) - in the Province of Grosseto are marked with red place marks. And those in the Provinces of Viterbo and Rome, in Maremma Laziale, are marked with green place marks. I constructed the map using the Google Maps facility. Depending upon how it loads in the page on your computer, you may need to reduce the zoom a little to see all of the place marks. Clicking on the "View Larger Map" link will take you (in a new window) to the same map within the Google Maps web site, in which all of the cities, towns, villages and hamlets are listed in alphabetical order in a left-hand menu within each of Maremma Livornese, Maremma Grossetana and Maremma Laziale. If you know the name of the town you want to visit, just click on its name and the map will automatically zoom in on it. Wishing you great fun exploring!